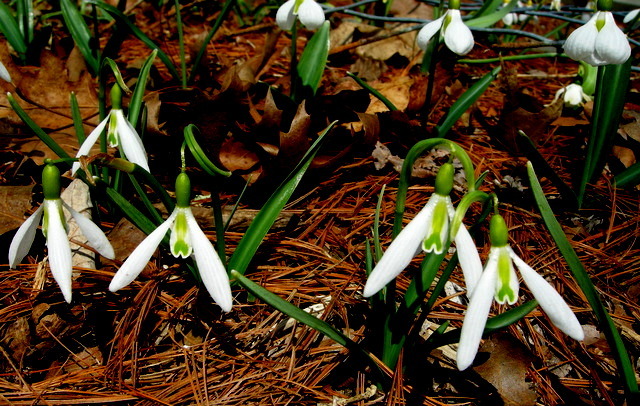 « Do All Snowdrops Look Alike? The 2019 Snowdrop Catalogue is on the sidebar, and we are taking orders. To access the catalogue, please click here. There couldn’t be more different looking snowdrops than ‘Wasp’ in the foreground above and ‘Diggory’ in the background. 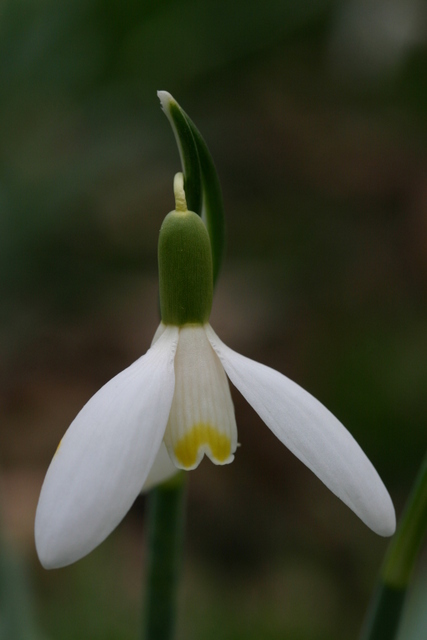 This post includes additional photographs and more detailed descriptions of four of the new snowdrops I am offering for sale in my 2015 Snowdrop Catalogue. The catalogue will be emailed to all my customers in early January, but you can view it now by clicking here. There are four more new snowdrop cultivars offered in the catalogue plus two snowflakes (leucojums), but they are either sold or about to sell out so I decided not to include them. I recommend ordering right away to secure the snowdrops you want. For entertaining descriptions of many of the remaining varieties offered, click here. Most of the information about the snowdrops profiled below comes from the indispensable Snowdrops: A Monograph of Cultivated Galanthus by Matt Bishop, Aaron Davis, and John Grimshaw (2006 Griffin Press)( called Snowdrops below). There is no other snowdrop that looks like ‘Diggory’ so if you think all snowdrops look alike this is the one for you. The squared-off pear-shaped flowers with seersucker outers and the large green inner mark visible even when the flower is closed, make ‘Diggory’ recognizable anywhere. The blooms resemble miniature hot air balloons hanging on tiny shepherd’s crooks, absolutely charming. The unique look is further enhanced by the pleated leaves visible in the photo below and characteristic of a Crimean snowdrop, G. plicatus. ‘Diggory’s’ leaves with their elegant side pleats are also very attractive. 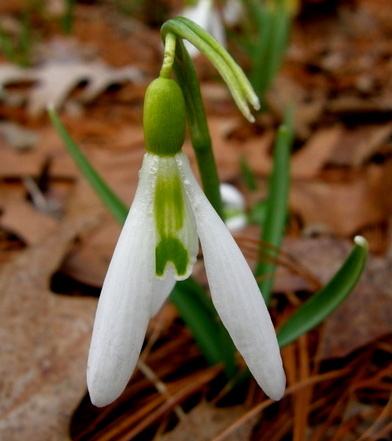 ‘Diggory’ is a relatively new snowdrop. It was found in a naturalized stand of G. plicatus in 1993 by two well known British galanthophiles and first exhibited in 1998 when it received a commendation. The name was chosen to memorialize the son of one of the discoverers. When Avon Bulbs in England asked its customers to name their favorite snowdrops, ‘Diggory’ ranked number 4 out of the 1,000 or more snowdrops in cultivation. 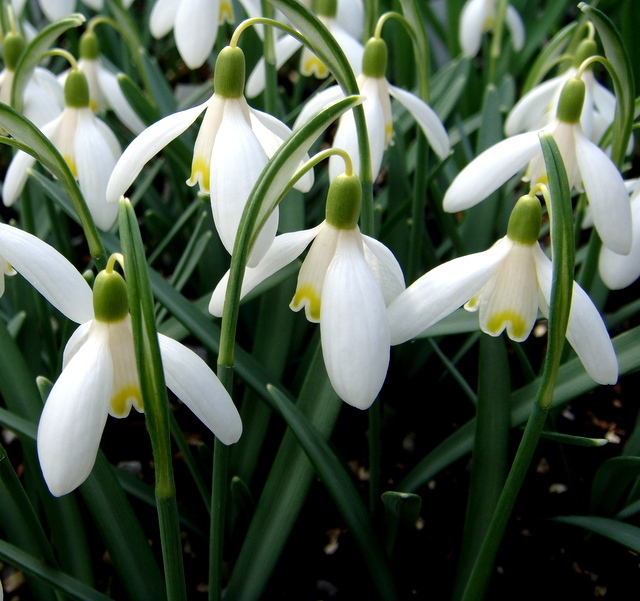 ‘Blonde Inge’ is a very desirable yellow-marked snowdrop. ‘Blonde Inge’ is unusual because the lovely yellow markings on its inner segments are combined with a green ovary (the little cap above the flower). 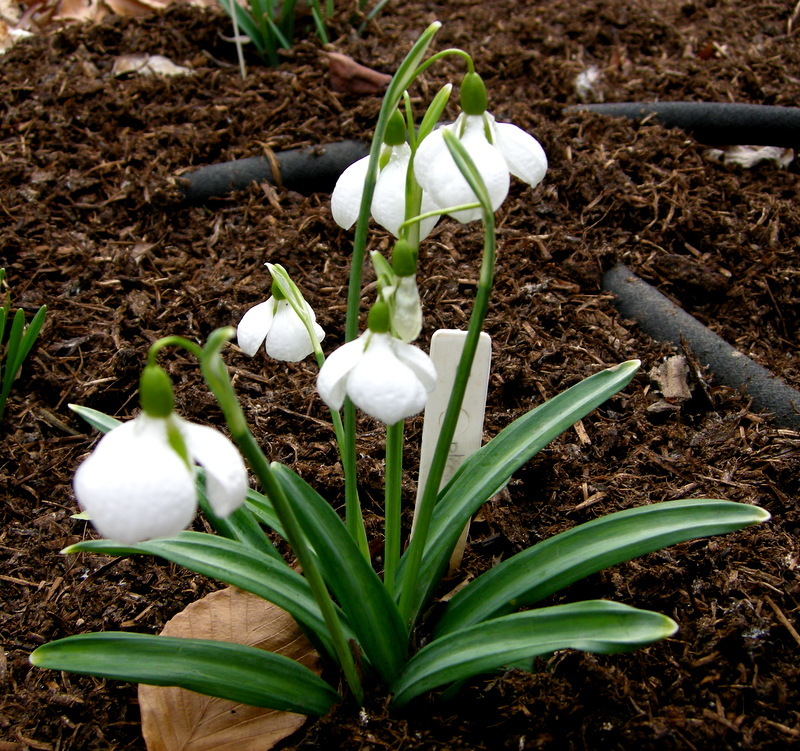 It is a cultivar of the common snowdrop, G. nivalis, and as such tolerates a wide variety of garden conditions. It builds up quickly and is very striking in a clump as you can see in the photo below. ‘Blonde Inge’ grows rapidly to form an impressive clump. ‘Blonde Inge’ was discovered in 1977 in a cemetery near Cologne, Germany, and introduced by Nicholas Top to the UK in 1993. The name came from the lyrics of a German foxtrot, which you can hear by clicking here. ‘Wasp’ has long, elegant outer segments. Matt Bishop calls ‘Wasp’ an aptly named snowdrop, and I have to agree. The very long and narrow outer segments stick out at an angle like wings and the tubular inner segments are striped to resemble a thorax. ‘Wasp’ flies around on its long pedicel in the slightest breeze completing the insect-like effect. 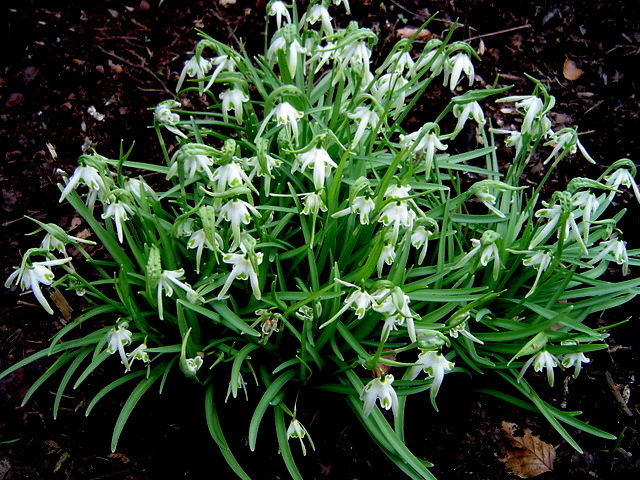 This charming and unique snowdrop caused a sensation among UK galanthophiles when it was first introduced in the late 1990s. 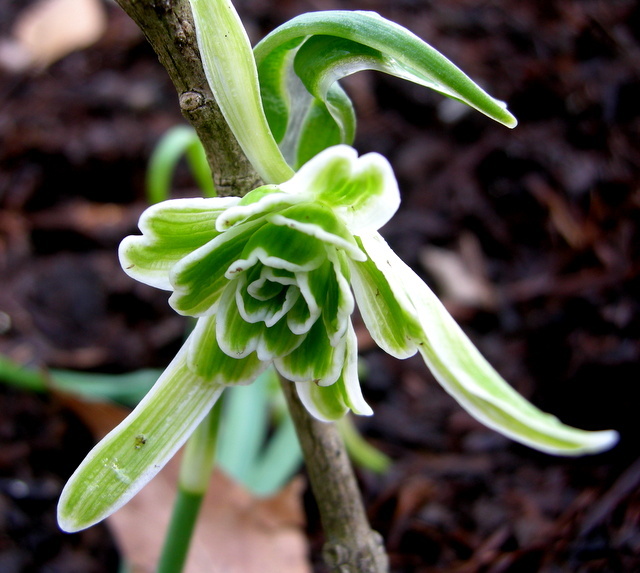 It was discovered in 1995 by British snowdrop enthusiast Veronica Cross at Sutton Court. ‘Walrus’ is a very uniform double snowdrop considering how unusual it looks. Snowdrops calls ‘Walrus’ “one of the greatest eccentrics of the snowdrop world”, but despite this it is not wild looking like ‘Blewbury Tart’ but instead a very regularly formed double. As you can see in the photo above, its ‘tusks’ are the three very long, linear, mostly green outer segments. They surround a lovely rosette whose segments curve outward to look like a green rose. Maybe my expanding clump of ‘Walrus’ will one day look like this photo taken by Alan Street of Avon Bulbs. 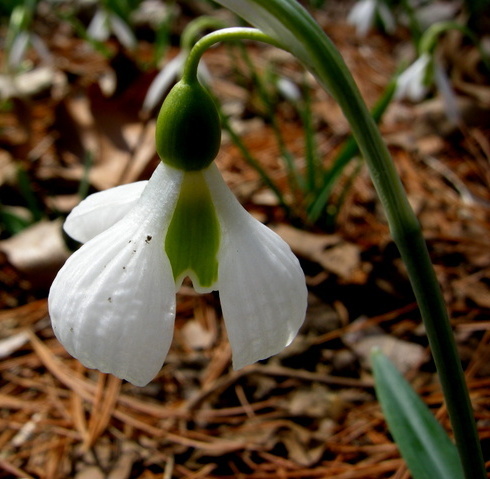 ‘Walrus’ is a cultivar of the common snowdrop, G. nivalis, and tolerates a wide variety of conditions. It is vigorous and multiplies well in the garden. It was selected in the 1960s by noted galanthophile Oliver Wyatt at Maidwell Hall in Northamptonshire, England. ‘Walrus’ ranked number 12 on the list of favorite snowdrops of UK gardeners. This entry was posted on December 9, 2014 at 4:23 pm and is filed under bulbs for shade, Shade Perennials, snowdrops, winter, winter interest with tags Carolyn's Shade Gardens, collecting snowdrops, galanthophile, galanthus, galanthus blonde inge, Galanthus Diggory, galanthus walrus, galanthus wasp, Matt Bishop, snowdrop articles, snowdrop bulbs, snowdrop catalogue, snowdrop flower, snowdrop plants, snowdrops, snowdrops for sale, snowdrops for sale U.S., snowdrops in the green. You can follow any responses to this entry through the RSS 2.0 feed. You can leave a response, or trackback from your own site. I will check out the catalog ….. this year I was hoping to get a unusual one and one that blooms in fall. Ooo, I love the look of Diggory! Walrus is so pretty, too, though it looks like the doubled floret is hard to see from above. Oh, I did not get the email for your post. I have it marked as instantly too. I will have to unsubscribe and subscribe again. I wonder how many people get unsubscribed from our blogs and never know it. Kind of frustrating. Carolyn, you do a good job showing the differences between the various snowdrops. I can see hows a collector can get hooked! Hi, Carolyn, I recently found your site and am very interested in some of your snowdrops, especially as I just started a few new shade beds. I do not like to order things online, since my email has been hacked and I am wary of putting financial information online. Would it be possible for me to phone you and give you my credit card number by phone? By the way, I am a graduate of Baldwin School!